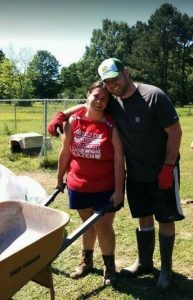 The first time I came to Arkansas was on the second annual LHK9 service trip in April 2014. Spring was a little behind in Boston that year, but as soon as we left the airport in Little Rock I saw that it was in full force in AR. The trees had bloomed, roads were lined with wisteria, and the sun was shining. Everything was green- including me. At the time, I didn’t know much about the shelters in the south; I knew that dogs died and I knew that our rescue saved some. I thought that if you worked in a shelter, you must love animals. I expected the shelters to be clean and filled with happy dogs. I was not prepared for what I saw on that trip. At the shelter my dog was rescued from less than a year before, I saw dogs living in several days’ worth of worm-ridden poop and bloodied kennel walls from their tails banging so hard against them. There didn’t seem to be any interest in spending time with dogs or even just keeping their living conditions healthy. One shelter worker told me that he only gave the dogs names because it was easier than learning their assigned numbers. On a tour of Pine Bluff, I tried to hold back tears as we saw kennel after kennel filled with up to 3 dogs, some totally emaciated. I met a white Pit Bull who had been there for months (she was related to a court case that was not yet resolved) and was skin and bones. That dog died in the shelter, and her image is forever burned in my brain. When rescue feels overwhelming, I think of her and keep moving forward. Over the last few years, I have volunteered a lot of my time with LHK9; I call it my second full-time job that pays in dog kisses. As a foster and Medical Coordinator, I have fostered 49 dogs, attended countless events, implanted hundreds of microchips and answered more questions about poop than I could ever count. During this time, my relationships with Arkansas fosters and volunteers became stronger and stronger. 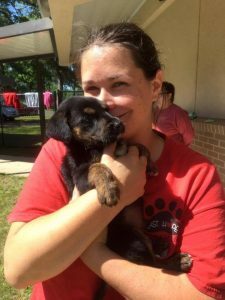 There is a very special bond between the person who took a dog from the shelter broken and sad down South, and the person who is entrusted with finding a FURever home for that dog up North. When housing in Boston got too expensive for a single gal (and since I work from home), I decided to make the move to Little Rock. In my 7 months in AR, I have learned that I will never stop being shocked by what I see in shelters. The dogs who cry when they are pet because they have never known affection. The vet who won’t even try to help a dying puppy. The dog owner who drops his dead dog on the shelter doorstep, causing a disease outbreak that kills 10 puppies in a couple days’ time. I have learned to take a moment to cry, then get right to work. I have learned that putting your foster on a bus headed North is a lot harder than handing him over to an adopter. I have learned that I cannot save them all, no matter what I do. I have learned to be happy with the impact that I can make, no matter how small. And I have learned to lean on my rescue community because they will hold me up every time. Now that I live in Arkansas, I was asked to help plan the annual service trip for 2017. I was ecstatic to be able to visit the shelters ahead of the trip to help determine what they need most. I met with all of our shelter liaisons, took measurements and priced out projects. When I tallied it all up and found the goal would need to be set at $17k, my heart sank. We have never set a trip goal over $10k and barely met $17k when the trip was over the previous year. The planning team decided all the work that was needed was too important, we just had to make it work. I experienced a few sleepless nights along the way, but we met the goal in 12 days. As of the day of this writing, we have raised $27,909 and are working to find the best way to spend the remainder. The projects for this year were beyond ambitious, but I know my rescue team and I knew they wouldn’t quit until everything was done. We were asked to patch up chain link fencing at Pine Bluff, but our team learned how to replace and install it themselves. 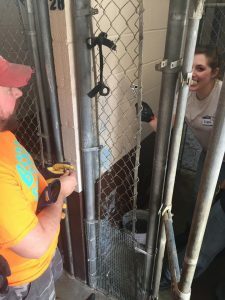 When they didn’t finish on the first day, 5 volunteers went back to the shelter to finish up the next day. When asked to shovel mud from flooded kennels at Bald Knob, our volunteers did it without complaint, laughing at how gross it was. The last hour at Bald Knob was a race to get the cleaned out kennels filled with gravel. We had four wheelbarrows of gravel going at once! 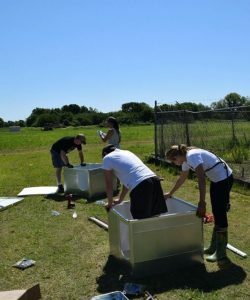 For the Hazen shelter, it took a group of 4 people almost 4 hours to put together 2 dog kennels that would protect dogs from the elements. At Stuttgart, a volunteer even encountered a live wire while cleaning (don’t worry, she’s ok!). These amazing people just worked through all of it. I am sure they were frustrated or tired at times, and a bunch got sunburned too, but they never gave up. They rallied together with smiles on their faces for the love of the dogs. The trip ended two weeks ago, and its effects are really starting to take hold. Dogs are moving out of shelters and into foster homes, and sponsorship fundraisers have started. The dogs at Bald Knob don’t live in mud anymore and as a result they are experiencing less stomach upset and their indoor kennels are easier to clean. Local volunteers have been back out to the shelters to do more work, inspired by what our group has done. The trees and bushes planted to provide shade at Hazen are growing and the dogs are sleeping in their fancy new doghouses. Food and supplies are stored safely in the new storage buildings. I am so excited for the crew to come back next year and see the things they built and repaired in use. The puppies in the repaired puppy pen, the dogs using the kiddie pools on the gravel pad. Just one day’s work in the shelter will last for years. I miss my friends in Boston. I wish we could have a dozen service trips each year. Having them here with us, all working together helps remind me why we do all of this. A lot of it is for the dogs, but some it is for each other too. The community we have created among us is so special. I like to say “find your passion and you will find your friends” because that is so true for me. I encourage the reader to do the same, and if your passion is helping dogs please consider joining our community!